The following article originally existed as an October 2018 homily by the Bishop of Little Rock, Anthony Taylor. With his permission, we offer it here to Little Rock Scripture Study users as we begin the new year. In the 11th chapter of Luke’s Gospel one of Jesus' disciples asks him to teach them how to pray and Jesus gives them the Lord's Prayer. 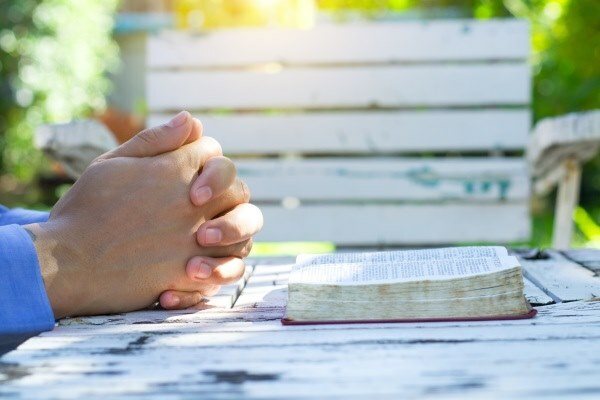 But notice, the question was not so much "what" to pray as "how" to pray: "Lord, teach us to pray just as John taught his disciples," meaning not so much the specific words to use, but rather "what are the attitudes and concerns that we should bring to prayer?" And so Jesus gives us six of what I call the “seven P’s of prayer,” which are: presence, praise, purpose, petition, pardon, protection and persistence. Let's look more closely at what the Lord's Prayer teaches us about how we should pray, no matter what words we use. And here I'm going to use the version in Matthew 7 which is more familiar to us. "Our Father, who art in heaven" ─ Presence. We begin prayer by consciously placing ourselves in God's presence, consciously reminding ourselves that we are in conversation with the Lord. If we just recite words mindlessly, we're not praying. So we begin by placing ourselves in the presence of Our Father, to whom we are addressing our prayer. "Hallowed be thy name" ─ Praise. Next we recall who we are before the God in whose presence we have come: he is our master and we are his servants. His name is to be hallowed, not our name. We depend on him for everything and we don't presume to know more about what is for our welfare than he does. Job expresses this when he says: "the Lord has given and the Lord has taken away, blessed be the name of the Lord." “Hallowed be thy name.” We praise the Lord even in our most difficult moments not only because of who God is, but also because of who we are, his servants...and when the Lord is glorified, we share in his glory. And so we glorify him already! "Thy kingdom come, thy will be done on earth as it is in heaven" ─ Purpose. We commit ourselves to building his kingdom, not our own kingdoms. We commit ourselves to doing his will, not our own, and to do so in our lives perfectly on earth because that is how it is done in heaven. "Give us this day our daily bread" ─ Petition. Then we proceed to ask God to provide us with all that we need, not just in general, but all our specific needs, our daily bread. And notice that this is not everything we might desire. The Lord fed the Israelites, with daily bread─manna─in the desert, but even so, those 40 years were in many ways a time of privation; they missed the "flesh pots of Egypt." Nowhere does God promise to satisfy all our desires because that might not serve his purposes. But God does promise to provide our most basic needs if we ask him to do so. And that's what we ask for, our daily bread, our basic needs. "Forgive us our trespasses as we forgive those who trespass against us" ─ Pardon. We dare ask for this pardon only to the degree that we are willing to extend it to others. And without God’s pardon we are doomed! Remember the parable of the Wicked Servant who had been forgiven a huge sum but was unwilling to forgive a fellow servant who owed him a small sum? "Lead us not into temptation but deliver us from evil" ─ Protection. We ask for protection from dangers from within, temptations. And from evils from outside of us, including disasters of every sort. These six elements should be present any time we pray. In this way, Jesus is not just giving us one prayer to say ─ the Lord's Prayer ─ he's also giving us a framework to guide us in all of our prayer, whatever words we use. We place our self in God's presence, praise him, commit to doing his will, petition him regarding our needs, pardon others, and seek his protection. To these six "p's" Jesus adds a seventh "p" in the parable with follows Luke’s version ─ Persistence. A man who wouldn't get out of bed at midnight to help a neighbor for friendship's sake will give in and answer his request if the friend just keeps knocking persistently. . . and God the Father will do the same. Bishop Anthony B. Taylor has been the bishop of the Diocese of Little Rock since June of 2008. His episcopal motto is "The Humble Shall Inherit the Earth,” taken from Psalm 37:11 and quoted by Jesus in the Beatitudes in Matthew 5:5. In addition to his theological studies for ordination, he earned a doctorate in biblical theology from Fordham University. New Beginnings: Finding God in the Unknown is the newest volume in our Alive in the Word series. New beginnings are often fraught not only with excitement and adventure, but anxiety and uncertainty. The road is no longer familiar, the terrain perhaps not as friendly. The Scriptures show us how God is present in these new beginnings of our lives, even when the path forward may be unknown. Matthew A. Glover, the author, is a deacon, a chancellor of the Diocese of Little Rock, a husband, and a father to one son and one daughter. Visit our exhibit at the Gulf Coast Religious Education Conference January 10-12 where Cackie will also be presenting a break out session entitled, “Hospitality: Welcoming the Stranger” on Friday afternoon.